SHAPEs are regional events created by Shapers, for Shapers. 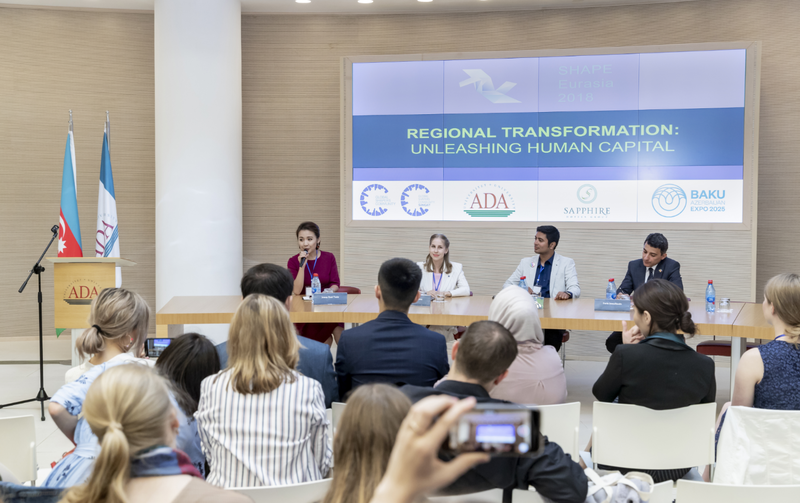 Sumgait Hub hosted 100 Shapers from 24 countries from 1-4 June for a programme focused on the theme of Regional Transformation: Unleashing Human Capital. As policy-makers look for ways to make economies more competitive in today’s fast-changing world, Shapers explored the most important instrument of progress – human capital. Vice-Rector of ADA University, Fariz Ismailzade, welcomed Shapers to Azerbaijan and emphasised the importance of education, skills and jobs to fuel economic growth, development and competitiveness in the region. Shapers explored the innovations needed in education, entrepreneurship, technology and gender equality to close the human capital development gap in Eastern Europe and Central Asia. Shapers also had the opportunity to explore the rich history of Baku, visiting the Bibiheybyat Mosque, Heydar Aliyev Centre, Baku Shipyard and Oil Fields, and the Old City running parallel to the Caspian Sea.